What is ketamine used for? Ketamine for depression is a viable option in certain patients who have tried other antidepressants and found very little to no improvement. Using ketamine appears to be a helpful option for patients who have exhausted other pharmacotherapeutic avenues. Current data suggest that a single infusion of ketamine is appropriate for patients with treatment resistant unipolar or bipolar depression without psychotic features who lack substance-use disorders. For decades, symptoms of depression have been treated primarily with medications that target the monoaminergic brain systems, which typically take weeks to exert measurable effects and months to exert remission of symptoms. Low, subanesthetic doses of (R,S)-ketamine (ketamine) result in the rapid improvement of core depressive symptoms, including mood, anhedonia, and suicidal ideation, occurring within hours following a single administration, with relief from symptoms typically lasting up to a week. Other options for patients with treatment refractory depression include neuromodulation interventions such as TMS, but even TMS is not effective for all patients and can be considerably more expensive than ketamine. Surgery is a last resort among the treatments for depression, and is usually reserved for severe and incapacitating major depression. Off label use of ketamine for depression is growing, and physicians should always exercise caution when using it due to its side effects and addiction potential. Ketamine infusion for depression usually costs $400 to $800 per treatment, and most ketamine clinics perform a series of 6 treatments over 2 to 3 weeks. Some providers offer 4 treatments over 1 to 2 weeks. Most ketamine providers request an upfront payment for a complete set of 4 to 6 infusions, some offering discounts or package deals. Depending on the price per infusion, this can cost the patient anywhere from $1600 to $4800 for a full series of IV ketamine treatments for depression. Ketamine has a more rapid antidepressant effect than that of typical antidepressants like selective serotonin re-uptake inhibitors (SSRIs). SSRIs include Citalopram (Celexa), Escitalopram (Lexapro, Cipralex), Paroxetine (Paxil, Seroxat), Fluoxetine (Prozac), Fluvoxamine (Luvox), and Sertraline (Zoloft, Lustral). SSRIs typically take six weeks to achieve full antidepressant effect. The delay in their therapeutic effect may be due to their targeted action on the monoaminergic system which is more upstream from the central nervous system sites of mood control. Ketamine infusion for depression is more rapid acting than SSRIs and SNRIs. One infusion can reduce or even eliminate symptoms of depression within minutes to hours. It has direct effect on the glutaminergic system as a NMDA (N-methyl-D-aspartate) receptor antagonist and an AMPA agonist. 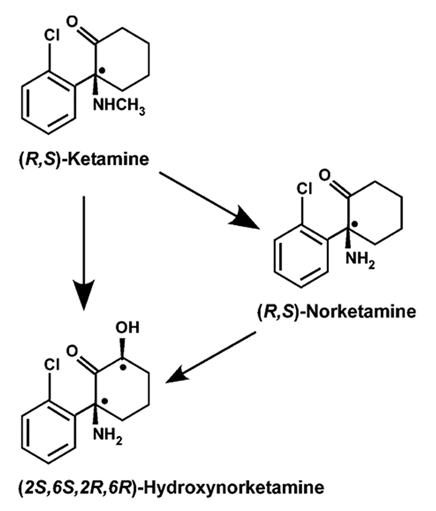 Ketamine becomes metabolized to (2R,6R)-hydroxynorketamine (HNK) which activates AMPA (α-amino-3-hydroxy-5-methyl-4-isoxazolepropionic acid ) receptors. 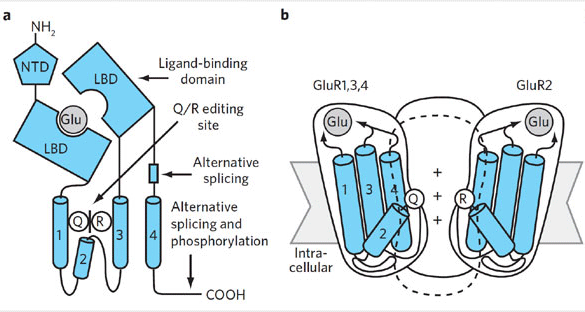 The direct effect of HNK on AMPA receptors is hypothesized to be responsible for ketamine’s anti-depressant effects. Is ketamine for depression more effective than SSRIs and SNRIs? The answer depends on how you look at it. If you are comparing one administration of an SSRI to one administration of IV ketamine, then ketamine will most likely be more effective by acting more rapidly and for a longer duration. A single ketamine infusion may have lasting antidepressant effects of up to two weeks or longer. In contrast, taking one pill of an SSRI or SNRI rarely has any significant antidepressant effect. SSRIs and SNRIs must be taken daily to have sustained depression relief. Ketamine can relieve depression within minutes to hours of initiating an IV infusion in patients who respond. Not all patients respond to ketamine, and ketamine carries its own risks and side effects. Ketamine for depression shows promise in quickly reducing symptoms of treatment-resistant depression and bipolar depression. Several small clinical trials have shown that a single subanesthetic dose of ketamine, 0.5mg/kg infused over 40 minutes, produces a quick antidepressant response within 2 to 4 hours of delivery. This antidepressant affect may reach a maximum at 24 hours after infusion, and last several days therafter, perhaps a week or two. A meta-analysis by Romeo et al analyzed ketamine’s efficacy in depression at day 1, day 2, days 3-4, day 7, and day 14 compared with placebo in treatment-resistant depression. Ketamine demonstrated a statistically significant antidepressant effect compared with placebo from day 1 through day 7. Analyses were repeated to determine if there were any efficacy differences between unipolar and bipolar depression. When including only participants with unipolar depression, ketamine’s efficacy was not affected from day 1 through day 7. Patients with bipolar depression, however, only saw efficacy through day 4. Randomized trials suggest that a single infusion of ketamine may be useful for short-term treatment of suicidal ideation. One trial compared ketamine (0.5 mg/kg) with midazolam (0.045 mg/kg) in patients with unipolar major depression who had responded poorly to three or more antidepressants (n = 57). Ketamine and placebo were administered as a single intravenous dose, and suicidal thoughts were evaluated 24 hours after the infusion. Absence of suicidal ideation was observed in more patients who received ketamine than midazolam (53 versus 24 percent). Another trial compared ketamine (0.5 mg/kg) with midazolam (0.045 mg/kg) in patients (n = 24) with clinically significant suicidal ideation. Ketamine and midazolam were administered as a single intravenous dose in patients who suffered from various psychiatric disorders such as unipolar major depression, bipolar disorder, or posttraumatic stress disorder. A decrease in suicidal ideation was observed over the first 48 hours in the ketamine group which was significant from the placebo group. While controversial, traditional antidepressants may increase risk of suicidal thinking. A possible additional benefit to using ketamine as an antidepressant agent is the avoidance of the black box warning on traditional antidepressants, namely, selective serotonin re-uptake inhibitors. The FDA assigned a “black box” label to SSRIs to warn consumers of a possible risk of suicidal thinking and behavior in some children and adolescents with major depressive disorder. The medical community is not in consensus about whether or not SSRIs induce suicidal thinking and behavior. Ketamine does not carry a black box warning about suicide risk. and (b) the AMPA receptor assembly as a tetrameric structure comprised of four subunits. What are the side effects of ketamine? How much does a ketamine infusion cost?